It’s the eve to the end of another NFL regular season. They sure go by quickly. This Sunday should be as eventful as any with only the Chiefs locked into their playoff seeding. There are a few notable story-lines to focus on this week. Peyton Manning: Best QB Season Ever? I’ve been asked by a few people if I think Peyton Manning is having the best season ever by a quarterback this season. The simple answer is no, it’s not even the best Peyton Manning season. The reasoning is a bit more complex. For starters, Manning’s season is not over yet, so it’s not exactly fair to ask this question right now. He has one more game and if we are to factor in the postseason, then that’s 1-3 more games. 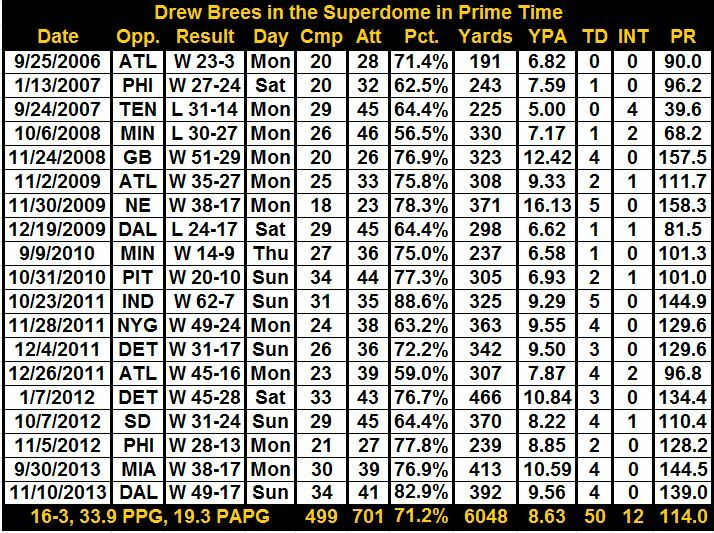 From a pure statistical volume standpoint, I do think it will go down as the best season in that he has a good shot to reach 55 touchdown passes and 5,500 passing yards. When factoring in efficiency, caliber of opponents and how he’s compiling the numbers, then I think it falls short of the all-time great seasons. Manning has already thrown 631 passes this season. He only needed 497 when he threw 49 touchdowns in 2004. His passer rating is 113.0, which is below the 121.1 he had in 2004. While his interception percentage (1.6%) is the lowest of his career, he has career-worsts in fumbles (10) and lost fumbles (6). The standard of defense has also fallen off greatly this season around the league and it’s hard to acknowledge many of the defenses Manning’s played as being good, let alone great. Manning only took the field for 149 drives in 2004 when he compiled his amazing numbers. This season the Broncos have 182 drives with one game to go. Even after we take out a few that Manning did not play, he simply has had quite a few more opportunities this season to put up touchdowns and yards. 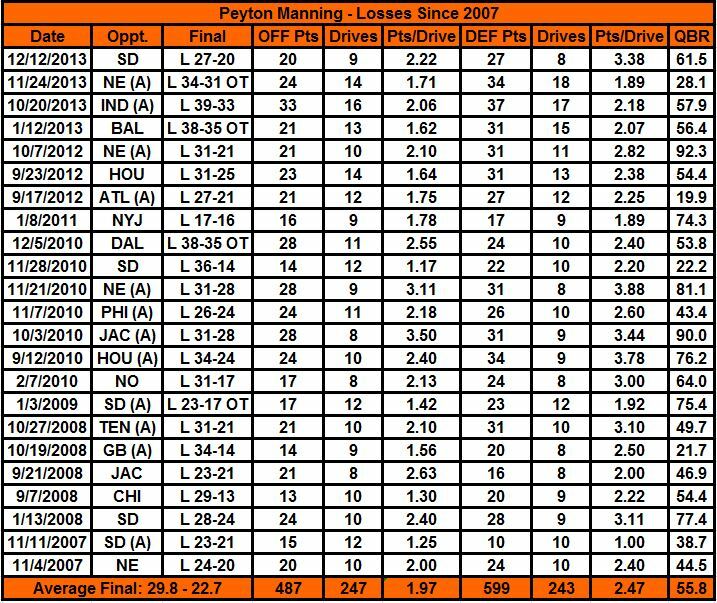 So I think 2004 is a superior season from Manning and I think his finest overall effort was 2006. No, that’s not because he won the Super Bowl, but it’s because he carried that heavily flawed team so effectively each week. He had to overcome the horrific run defense. He led the best third-down offense ever at the time. He had a rookie running back (Joseph Addai). He had no No. 3 WR thanks to injuries to Brandon Stokley. He was as effective as ever at throwing downfield to Reggie Wayne and Marvin Harrison. He only gained 34.3% of his yards via YAC, which is a career low. In 2013, he’s enjoying a career-high 48.5 YAC% from his receivers. When ESPN introduced their QBR stat, the first season I wanted to see was Manning’s 2006, because I felt it could be as high as any in the last decade. Sure enough, when ESPN added more QBR data, Manning’s 2006 is the best at 87.2. His 82.2 QBR in 2013 is only his personal 4th-best season and this thing only goes back to 2006. 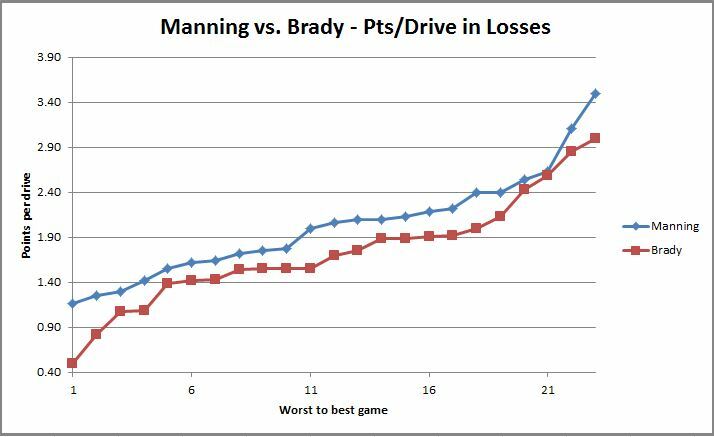 With all that said, I do think Manning came up just a few drives short from having had the greatest season ever this year. The margin in football is usually that small. Had Manning completed a 19-point comeback in the fourth quarter in Indianapolis, threw a game-winning touchdown in overtime in New England and at least tied the game with a 97-yard touchdown drive against San Diego, then I probably would say it’s the best QB season ever. Why would it change after three drives? Because in addition to boosting his stats even more, that’s adding the stuff of legends to his season. Remember when Peyton went back to Indianapolis and brought his new team back from a 19-point deficit in the fourth quarter? No, I just remember him getting hit as he threw and the pass was intercepted. Then his running back fumbled in the red zone to end the last rally attempt. Ho-hum. Remember when Bill Belichick took the wind in overtime and Manning embarrassed him again with a game-winning touchdown pass? No, I just remember two punts and the game pathetically ending on a muffed Denver punt. Remember when Peyton led his team back from 14 down in the fourth quarter with a 97-yard game-tying touchdown drive against San Diego? No, I just remember another play where he was hit as he threw and the pass was intercepted. See, it’s only three drives and I frankly don’t even care if the Colts/Chargers both came back to win. Had he finished those games with 3 more TD passes (and 2 fewer INTs in return), then yes, that would probably be enough for me to put him over top of his own seasons and ones like Dan Marino 1984 and Tom Brady 2007. 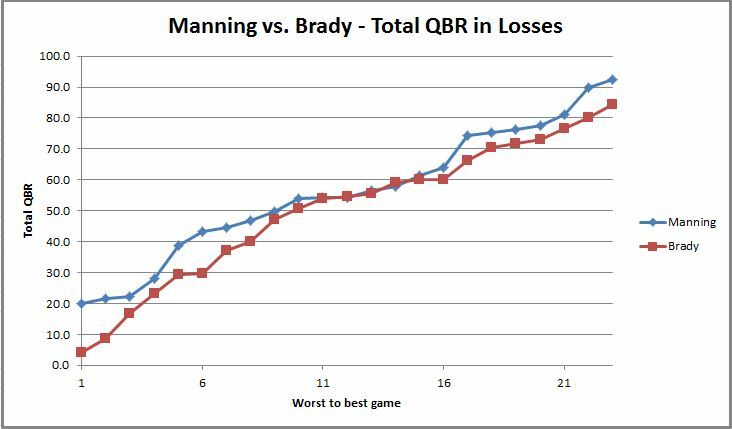 Ultimately, the fact that one quarterback has multiple seasons in the conversation for best ever says enough about Manning. The 2013 Green Bay Packers are Above the Law, making comebacks that never happened under Mike McCarthy’s watch with better quarterbacks. This team is Hard to Kill and has been Marked for Death since November 4, but they’re Out for Justice against Chicago this week. Jay Cutler will be Under Siege against a team he’s been terrible against. The Bears are On Deadly Ground and it could be Dark Territory on Sunday night. It was an Executive Decision to hold him out this long, but Green Bay’s Glimmer Man is back in action and there’s a Fire Down Below in Rodgers, a true Patriot playing his first game in almost two months. The Bears might be leaving 2013 with some Exit Wounds. They’re going to regret starting last week’s game Half Past Dead. Damn, Steven Seagal’s career really hit the skids over a decade ago. I picked Green Bay in the preseason to win the division. When Marc Trestman made the move to go back to Jay Cutler, I felt the Bears would beat Cleveland, but lose to the Eagles and Packers (with a good assumption that Aaron Rodgers would be back) to finish 8-8 and miss the playoffs. Now I did expect the Lions to be the team that took advantage, but it’s the Packers coming through and bringing back one of the best players in the game just in time for the Week 17 division clincher. Is this one really as simple as Rodgers is great, he rarely has a bad game and he’s going to feast (as will Eddie Lacy) on that poor Bears defense while Cutler has to overcome the 1-8 mark against Green Bay (with atrocious stats)? It would seem so, but at least the game is in Chicago and there’s an expected rust factor from Rodgers. Still, let’s not forget it was Josh McCown for the first meeting and he made some incredible throws in that 27-20 win in Green Bay. There’s not a throw McCown can make that Cutler can’t. The problem is there’s a lot of stupid throws Cutler will make that any smart quarterback wouldn’t, and that’s how he gets himself into trouble. The Packers are scoring and allowing plenty of points, so it would expect to be a high-scoring game, but Rodgers has the lowest turnover ratio in NFL history while Cutler is more prone than most to giving away the ball. When you talk about a QB’s legacy, this is a huge game for both. Cutler is playing for a long-term job in Chicago, which could be likely should he come through with a big performance and push the Bears into the playoffs. For Rodgers, this would be a lost season for most quarterbacks after breaking their collarbone in November. He’s had just enough time to recover and the Packers have won just enough games — coupled with Detroit & Chicago losing enough — to stay alive for his Week 17 return. It wouldn’t be fair to put a lot of blame on him for losing and missing the playoffs on Sunday night, but it’s a great opportunity and his playoffs start now. He has to play well in this one and I think he will. I also think Cutler will make just enough mistakes. If Chicago wins, it’s almost predictably going to be with a fourth-quarter comeback, which Cutler usually does well at as long as the game actually gets to that point. Now would be a great time for Rodgers to snap that eyesore streak of being 0-20 at fourth-quarter comebacks against teams .500 or better. I don’t think the Packers have enough on defense to make a 2010-type title run, though there are 2010-like things happening for them again. It all starts with beating the Bears in Week 17 to make the playoffs, then they can go from there. It’s the game many people expected would decide the NFC East since the schedule came out. But there is one big surprise: it’s Kyle “Neckbeard” Orton instead of Tony Romo at quarterback for Dallas. So let it be known Romo finished 2013 with a 1-0 record in elimination games, because he can’t lose this one after having back surgery. It’s a shame because it does weaken the game as Orton, while more than capable of moving the ball in this offense, is just not that effective when the pass rush gets to him. Romo has that unique ability to get out of trouble and make something happen. The last road game for Philadelphia featured an unexpected shredding of the improved defense by Matt Cassel, so anything’s possible, but I think the Eagles are playing too well on both sides of the ball for Dallas to pull this one out. The Eagles (especially the offense) have actually played better on the road than at home this season. Nick Foles did have his worst game of the season — really his only down performance — in Philadelphia against the Cowboys, but that was the day he suffered a concussion. Given his season and the way the Cowboys have played on defense most weeks, it’s hard to imagine the Eagles fail to score at least 28, which should be enough here. Do I think the Steelers have any hope of making the playoffs? They need four things to happen: win, Miami loss, Baltimore loss and San Diego loss. I expect the biggest problem will be getting the San Diego loss since the Chargers are at home against a Kansas City team basically mailing it in for Week 17. Now if the NFL actually had a great playoff system where every win counted, then the Chiefs would be playing for a higher seed and would actually try to win this game. The Saints cannot be trusted on the road. The Patriots rarely lose two games in a row. These are two talking points battling with my gut when picking some of the top games in a loaded Week 16. Regardless of venue, I know the Saints have favorable matchups against that Carolina secondary, which was predictably torched by Drew Brees two weeks ago in the Superdome. I know more talented versions of New England’s offense have struggled with Baltimore’s defense, and the Ravens have had one of the toughest home venues for any visitor. Most of the past meetings were in Foxboro. So should I just trust my gut on these two games and trust the superior QBs to make up for last week’s shortcomings, or is there something off about both matchups that really does favor the home teams? The “Saints are so bad on the road” thing has gotten too out of hand this week. Lest we forget the Saints are a league-best 24-15 (.615) on the road since 2009 (New England is second at 23-16; tied with Philadelphia). That’s hard to ignore. But what happens when we only look at road games against teams finishing the season with a winning record? Then the Saints are 7-8 (.467), which is still the best winning percentage since 2009. They are on a 1-6 stretch, but four of the losses were last year without Sean Payton. From 2009-11 the Saints were 6-2 with a 42-34 loss decided on the final play in Green Bay (2011) and a 30-24 loss in December in Baltimore (2010). Yes, this does not include outdoor playoff losses to the 7-9 Seahawks (2010) and 13-3 49ers (2011), which certainly fuel the narrative. The Saints clearly do not put on many dominating displays against quality teams like they do in the Superdome, but this team can play on the road and the Panthers are nowhere near as tough of a matchup like Seattle was. I still expect a tough, close game with the NFC South title on the line. I expect Carolina to show much more offense than two weeks ago, but I have changed my mid-week pick and am going with the Saints to get this one now. The team that does drop significantly on the road against a quality opponent is the Patriots, who are just 3-11 (.214) with six straight losses, including three this year that ended with Tom Brady throwing a game-ending interception inside the 30-yard line. Post-ACL injury, rarely has Brady done well on the road against a quality opponent, yet leave it up to NFL Network’s Deion Sanders to say Brady can play anywhere while Peyton Manning needs home-field advantage. 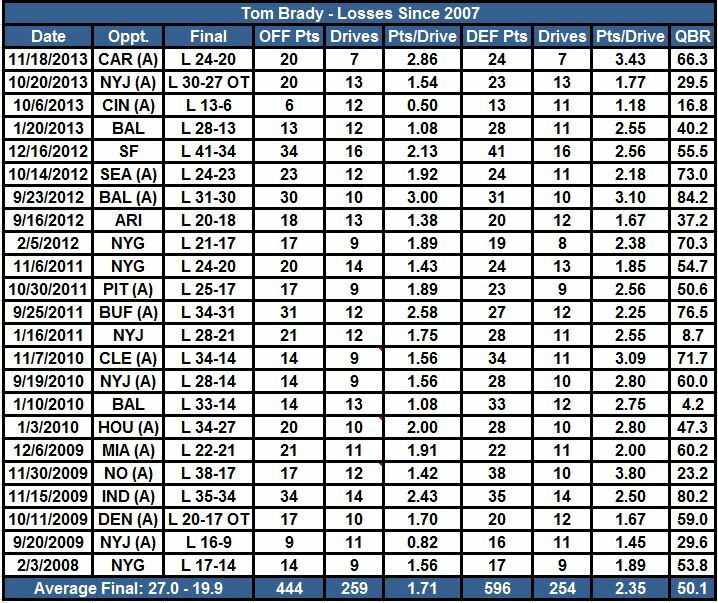 Brady also has a career history of under-performing against Baltimore’s defense. He has 8 TD, 10 INT in eight career meetings. This is not one of the best Baltimore defenses he will see, but it’s not a bad one and it did just hold down the Lions pretty well on Monday. It sounds like Aaron Dobson will be back for the Patriots, so it won’t just be a bunch of white slot guys controlling the offense, but there still isn’t a tight end threat or any real deep-ball threat. It’s also being reported that Nate Solder and Kenbrell Thompkins are out, so that makes it harder on the Patriots. Baltimore has done well in the past to limit the YAC for Wes Welker, so I doubt Julian Edelman and Danny Amendola will go off the way they have against Buffalo and Miami this year. Then again, those were division opponents who should have known what to expect by now. I have a bit more faith in John Harbaugh’s staff — Ravens have played the Patriots as well as anyone in recent years. The Baltimore offense worries me with the lack of a running game and the way Joe Flacco has played most of the season. If they can turn it on again for the Patriots — there are some favorable matchups down the field — then I can see this being a successful day, but it’s going to hinge more on the defense keeping the score down. If this game’s not close, then something’s really off. Both teams (along with Chicago) have played a league-high 11 games decided by one score this season. Both have had some absurd wins in the last few weeks alone. Baltimore (8-6) needs this game even more than the Patriots right now. I’m going to give it to them, but I know what picking against the Patriots usually leads to. I have no real confidence in the Steelers/Packers, Cowboys, Dolphins and Bears/Eagles, so this should be an interesting week. Also, for some reason — oh yeah, the defense — I’m feeling a bad vibe over Denver in Houston. Matt Schaub starting raises the probability of an upset. That Denver defense needs more stops. Houston plays almost everyone close and has lost 12 in a row (8 failed GWDs). If the Chiefs have another impressive showing against the Colts, then this might be the team to watch out for in the playoffs. It could be another case of things coming together at the right time, namely the offense starting to produce and the chances of the defense getting back to where it was to start the year. I have been getting the “big games” correct lately, though the Patriots did not finish the job in Carolina. Still, that game provides part of the reason why I expect the Saints to beat Carolina on Sunday night. Until the last drive, which called for some desperate throws, Tom Brady picked apart the Panthers’ suspect secondary all night. The Patriots are the best passing team Carolina has played all season, which says a lot since it’s the worst New England passing offense since 2006. The only other respectable passing game Carolina saw was Seattle in Week 1. While the Seahawks put up 12 points, Russell Wilson was 25-of-33 passing for 320 yards and a game-winning touchdown pass. Carolina enters on a nice eight-game winning streak, but the three wins against teams .500 or better came by a combined 9 points. Playing a top quarterback makes a difference. Just ask the Kansas City Chiefs. While both games against Brady and Wilson were at home for Carolina, Sunday will be in New Orleans in the Superdome against Sean Payton and Drew Brees. Given how poor the effort was in Seattle on Monday night, expect a much better performance. The Panthers do not have the secondary to match what Seattle did. The very first game on the list was the emotional return to the Superdome following Hurricane Katrina. It was a great night for the Saints, but it was actually one of the weaker offensive performances on the list. The nine games since 2011 have been freakishly good, and there’s no great explanation for it. Four of those last nine wins were against playoff teams and that number could grow to five or six depending on how Miami and Dallas finish this year. A Thursday game is beneficial to the home team in terms of not having to travel on a short week. A Monday game would give the Saints an extra day of preparation, which benefits the best-coached teams. But there’s no real reason the Saints should be any better at a Sunday prime-time game than the Sunday 1-4 p.m. games. This season the Saints are 6-0 at home and four of the wins have been against teams .500 or better. Sean Payton has won his last 15 home games, dating back to 2011. I have never been to New Orleans, but the atmosphere down there for a prime-time game seems like it would be more beneficial than for most teams. That’s why home-field advantage was so crucial for this team and why Monday was such a letdown, but truthfully it was always going to be a struggle to get the No. 1 seed. The Saints likely have to take care of Carolina twice just to win the NFC South, so this game is the most important one in the regular season for New Orleans. Forget about Monday. I’m sure the Saints have and will until they have to return to Seattle. I’m not expecting Carolina to get blown out like many teams do in New Orleans, and that’s a tribute to the No. 1 scoring defense. But if the Saints handle this week the way they usually do against a Carolina team with flaws that have rarely been taken advantage of, it’s going to be a long night for the Panthers. Okay, that looks better, even if I don’t feel any better about it.